Excellent combination of two different grains : 3000 Grain and super thin 8000 grain. To give your knives a professional razor sharpening, you must use the combination of the thin and super thin stones. After sharpening the knives with grain 240 and grain 1000, you can use the grain 3000. After the sandstone 3000, use the grain 8000. The 8000 grain was specially developped for Kasumi very sharpened knives. The 8000 grain is almost the same grain and of the same quality of the natural grain used to sharpen Samurai Japanese swords. 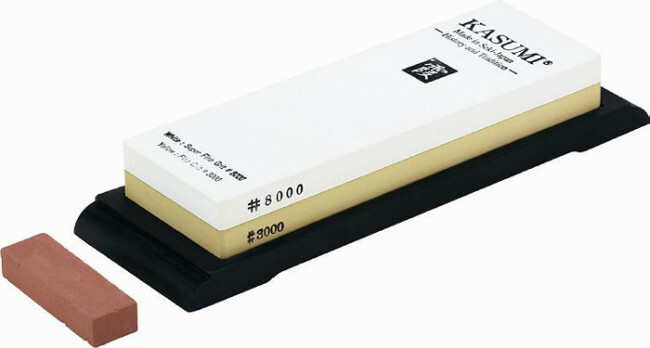 The mix 3000 8000 will provide Kasumi knives with an excellent cutting-edge. The stone is placed on a plastic base. Stone size : 18x6 cm. Height 3 cm. A little stone is included to trim the stones 3000 and 8000 after having used them many times.